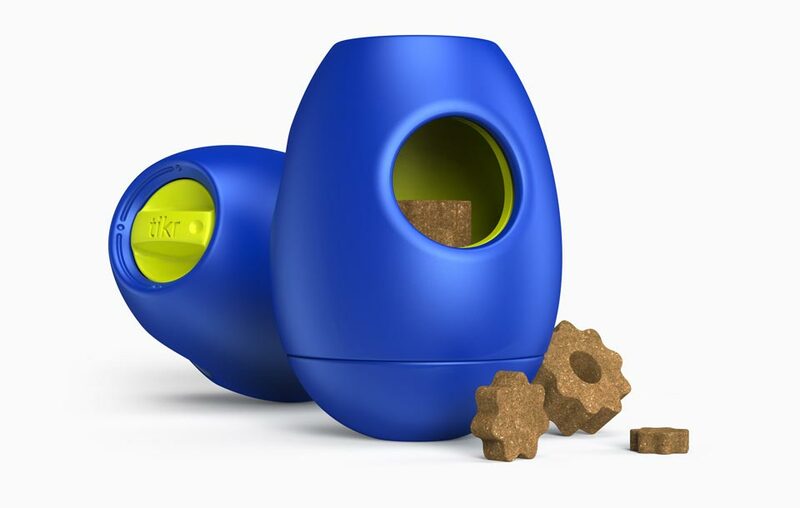 Tikr: a Snack Activity Toy for Dogs! Snacktivity at its finest! Unlike anything you've ever seen before, tikr offers a tail waggin' new experience both you and your dog will have a blast with, over and over again! Tikr excites, surprises, and engages your dog's mind and body, all while helping to reduce anxiety issues! Tikr's magic comes from the built-in timer, and strategically-sized holes. Load tikr with different sized snacks, then set the timer. As the timer unwinds, the holes will slowly line up allowing snacks to casually fall out according to size. Snacks that remain inside will keep dogs mesmerized as they play, for upwards of 45 minutes! They'll be continually rewarded along the way, with the largest snacks being saved for the very end. Best of all, tikr uses no electronics or batteries. Load tikr with an assortment of small, medium, and large snack sizes. Use specially designed tikr snacks to maximize the experience. Twist the dial to set the timer to the desired amount of play. Up to 45 minutes. Keep'em guessing by randomizing the time. As the timer slowly unwinds, snacks will begin to fall out when it's their time to go. First the small, then the medium, then lastly... the large snack. Dogs absolutely LOVE playing with tikr! Tikr is ready to ship... your pup will thank you for it! Tikr is WAY more than just a toy! And then, the adventure starts all over again! So, what makes tikr... tick?